Symbols*: Buffaloes are powerful creatures. Their beauty and strength echo the beauty of the vast earthly terrain that they once dominated. The sacred pipe is a symbol of communal peace. It is decorated with feathers, symbols of magic and flight. The goddess’s flowing hair is a life force. Her head and armbands are symbols of eternal strength. The buffaloes traverse the waters of the unconscious, their supernatural powers rippling the waters with energetic force. The pentacle moving through the sky is a symbol of the oneness of all life. The four elements and four cardinal points are all integral aspects of our existence and represent wholeness. Description*: White Buffalo Calf Woman was a sacred spirit of the Lakota people. One day she dressed in beautiful white clothing and appeared before two hunters out on the plains. One man was so awestruck by her beauty that lustful feelings began dominating his thoughts. His companion did not trust the exquisite vision before them. It was unusual to spot a woman wandering the plains alone. As the men drew closer to White Buffalo Calf Woman, she could decipher the lustful man’s thoughts and she began to lure him to her. The man could not hold back his desires and ran into her embrace. At that moment, a cloud of white smoke enveloped the man. As the smoke dissipated, all that was left was a skeleton. White Buffalo Calf Woman instructed the other man to return to his camp to prepare the leaders for a visitor. Upon her arrival, she brought the people a beautifully decorated pipe. She conducted several ceremonies, showed them how to use the pipe, and then quietly walked away from the camp as she metamorphosed into a white buffalo. In addition to bringing people the sacred pipe, White Buffalo Calf Woman also assisted young women during puberty ceremonies and offered guardianship during this rite of passage. Possible Meaning: White Buffalo Calf Woman’s transformation into a white buffalo is a reminder that we are connected with all living things. Our concern for the future must include the safeguarding of our natural resources and the honouring of our Earth Mother. If we exercise concerns for the earth we will be more in tune with all of earth’s creatures. The animals’ spirits continue to reside in our unconscious. By taking care of our environment and the creatures who inhabit it, we are taking care of an important part of ourselves. Thoughts/Points to Ponder: This queen is warm, earthy, sensual, nurturing, and resourceful. She is the mother of us all, yet shows these qualities only when it suits her. 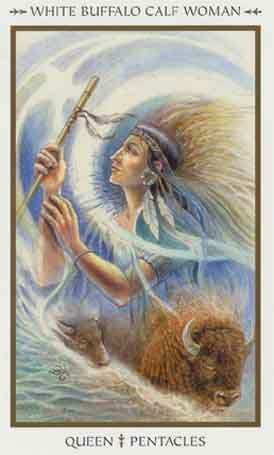 The Buffalo is her animal spirit, or animal totem, representing abundance.